NEW YORK--(BUSINESS WIRE)--JetBlue (NASDAQ: JBLU) and Amazon today announced a generous new shop and earn program for JetBlue’s TrueBlue loyalty members, further building on an innovative relationship that already delivers to customers unlimited streaming entertainment over JetBlue’s acclaimed free Fly-Fi high-speed inflight Internet. 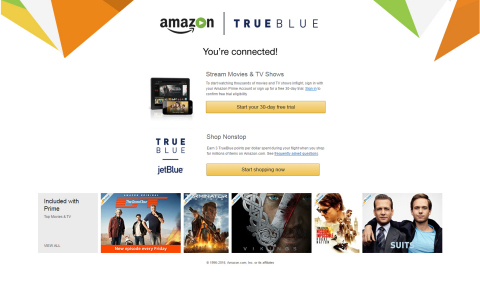 The new benefit offers TrueBlue members who shop on Amazon – in the air or on the ground using a unique JetBlue link – the ability to earn three TrueBlue points for every eligible dollar spent on Amazon.com (a). TrueBlue members can use the points to book one-way and roundtrip award flights on JetBlue-operated flights with all seats available for redemption with no blackout dates. Earn Points While Flying: TrueBlue members have an opportunity to earn points for shopping while they fly. Customers who log into Fly-Fi using their TrueBlue membership, or sign up for a TrueBlue account and then log-into Fly-Fi, will earn points while they shop and fly. The benefit begins rolling out on aircraft in December and will be installed on all aircraft by January 2017. Earn Points on the Ground: TrueBlue members who want to earn points for any of their Amazon purchases – even when not flying – can sign in to their TrueBlue account at trueblue.jetblue.com from anywhere and click on the Amazon link or go directly to trueblue.jetblue.com/web/trueblue/amazon. JetBlue’s TrueBlue loyalty program rewards all customers, regardless of their travel frequency. With TrueBlue, there are no blackout dates with all seats available for redemption, and points never expire. While redemption levels vary, the amount of points a certain trip requires is directly tied to current fares, and when flight fares are lower, so are award flight point fares. When searching for travel on jetblue.com, customers should select “points” instead of “dollars” to redeem TrueBlue points. JetBlue will complete installation of Fly-Fi on all aircraft in 2016, advancing its effort to become the only U.S. carrier to offer free high-speed Wi-Fi Internet on every aircraft available to every customer. JetBlue currently has Fly-Fi installed on its entire fleet of Airbus A320 and A321 aircraft, and is nearing completion of its fleet of Embraer 190s. With the collaboration with Amazon, JetBlue’s differentiated approach of providing high-speed Internet at no additional cost with a variety of entertainment choices and the ability to stream titles from Amazon Video is consistent with the airline’s founding mission of bringing humanity back to air travel. When JetBlue launched, it revolutionized inflight entertainment by introducing seatback televisions with free live programming - a popular feature that remains today. JetBlue has set itself apart with award-winning service and onboard products. JetBlue flights offer the most legroom in coach (b), unlimited and complimentary brand name snacks and soft drinks, live DIRECTV® programming at every seat in addition to 100+ channels of SiriusXM Satellite Radio®. 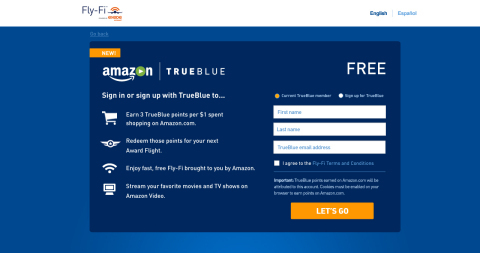 (a) Customers connected to Amazon via Fly-Fi if onboard or signed into their TrueBlue account and using their unique link can earn 3 TrueBlue points for every $1 spent on Amazon on any eligible item. To see list of items that are not eligible click here. Points will be posted 60 days after item is shipped.